I once cooked too much chicken fajita mix for us to finish off in one sitting – a very rare occurrence for us to have leftovers of something this tasty. 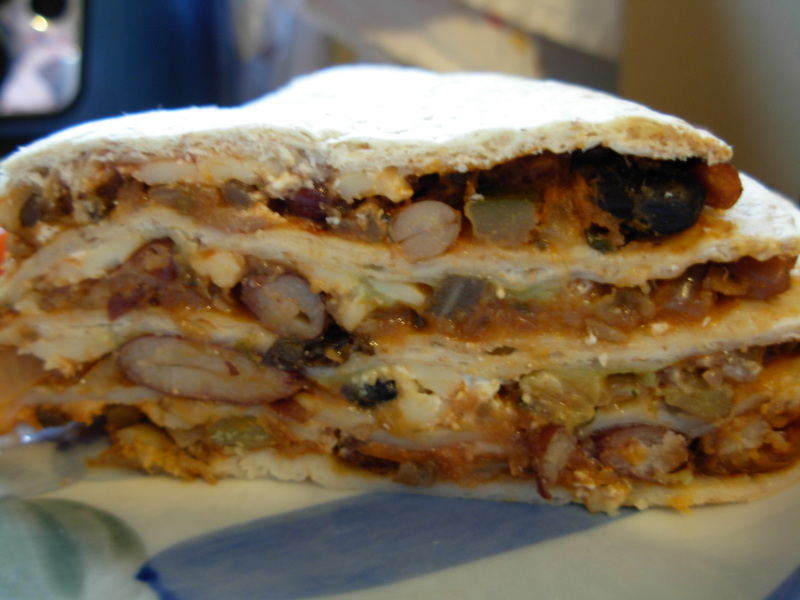 So the next day, in a bid to find something to do with it, I invented a baked tortilla stack. 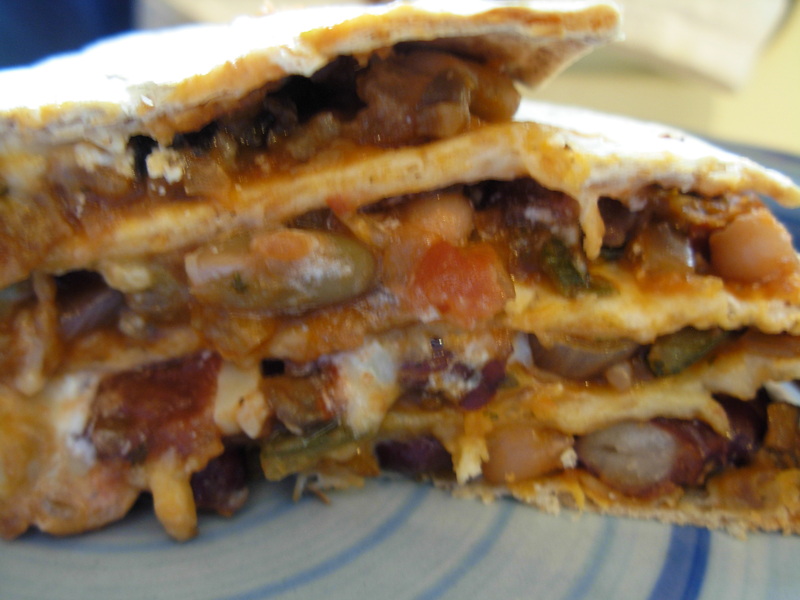 I have since adapted it to vegetarian filling it with delicious Mexican beans. If you leave it until the following day it firms up and is perfect for slicing and taking on picnics. I later discovered various similar ideas on t’internet & in recipe books. I really don’t know if I was subconsciously inspired by something I had read at some earlier time, or if it is just darn near impossible to have original thought these days because it has all been done before! Anyhoos, it is super-quick to make if you already have the “fixins”. 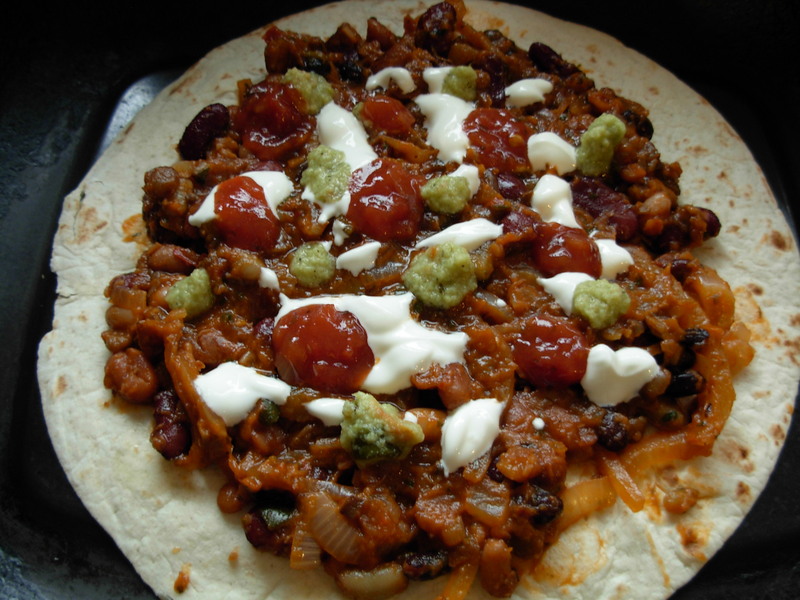 Slap a flour tortilla on a baking tray & spread thinly with your favourite spicy Mexican-style mix. This can be chicken or steak cooked in fajita seasoning, or you can go veggie with mixed beans, or whatever takes your fancy. The trick to success is to spread thinly & don’t go right to the edge of the tortilla. 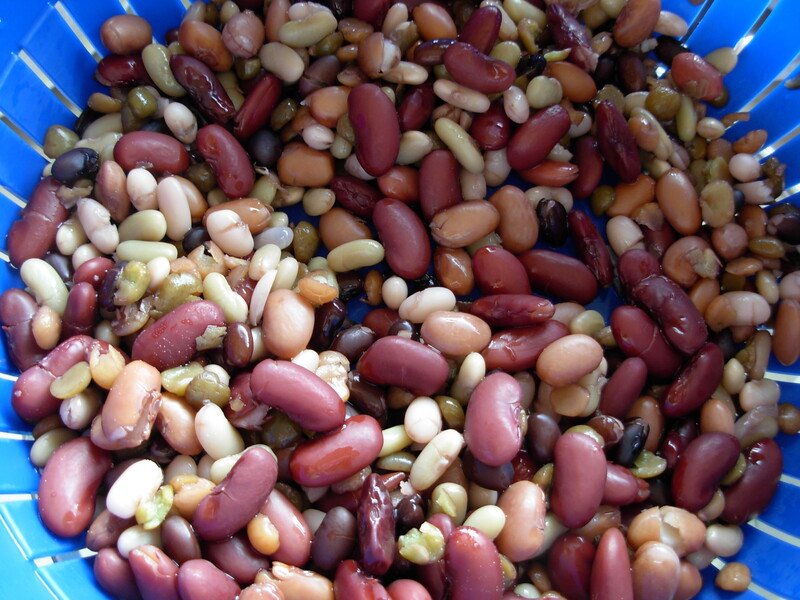 By the way – this Mexican bean stew is also lovely served with rice or couscous. 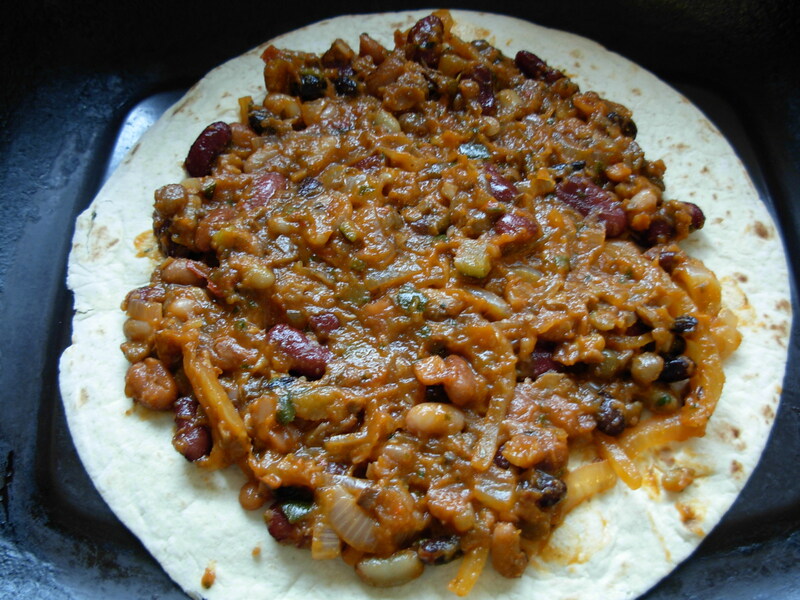 Slap on another flour tortilla and press down firmly so the filling flattens and spreads to the edge. Repeat until run out of filling or tortillas. Bake for 15-20 mins in a moderate oven. 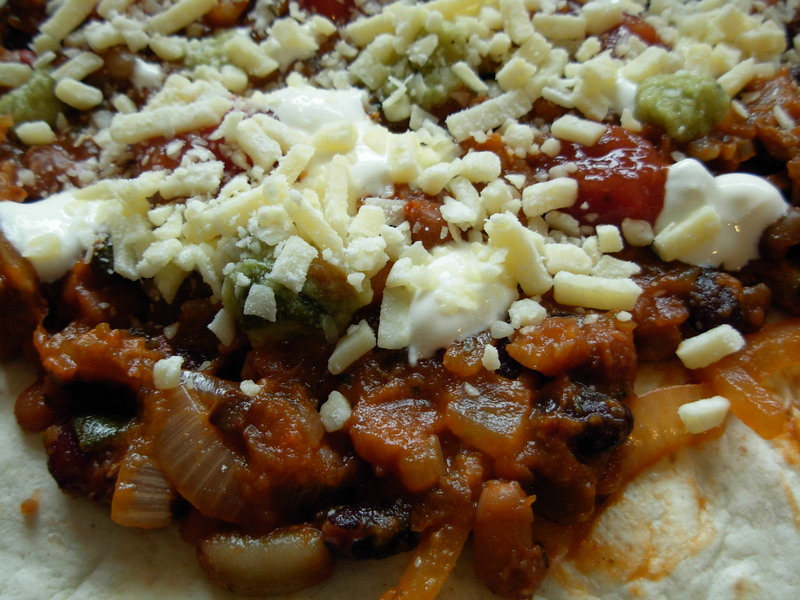 The cheese will be all melted and gooey and the tortillas will be a mix of textures, with soft centres and crisp edges. You can eat it straight away but these have become my favourite picnic food as they are even better cold the following day. Left overnight in the fridge, some sort of magic happens and the whole thing becomes much more solid & easy to handle. This is great because on the day of the picnic, all you need to do is cut the stack into wedges and wrap the whole thing in kitchen foil/ baking parchment. They are great for pleasing everyone, as it is easy to whip up two the day before – one for the meat eaters & one veggie. 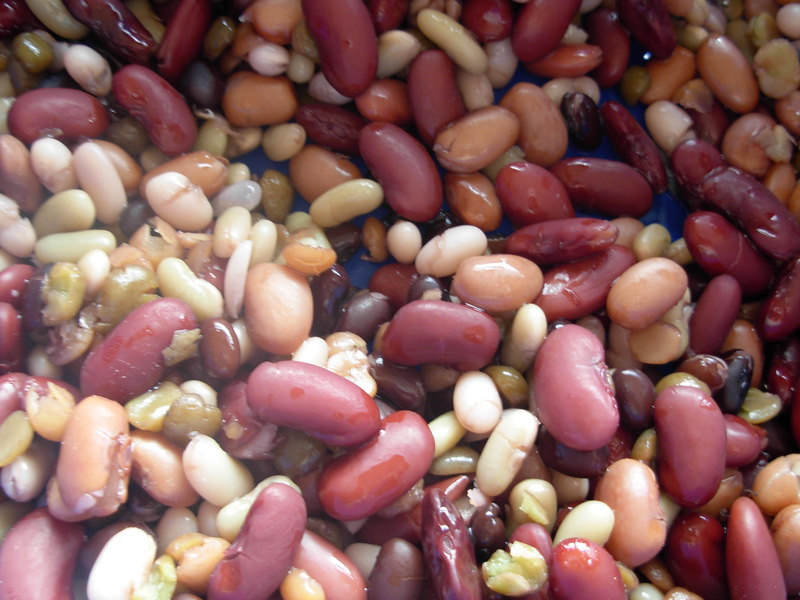 I’m a meat-eater but I have to say I do prefer the veggie bean version of these! 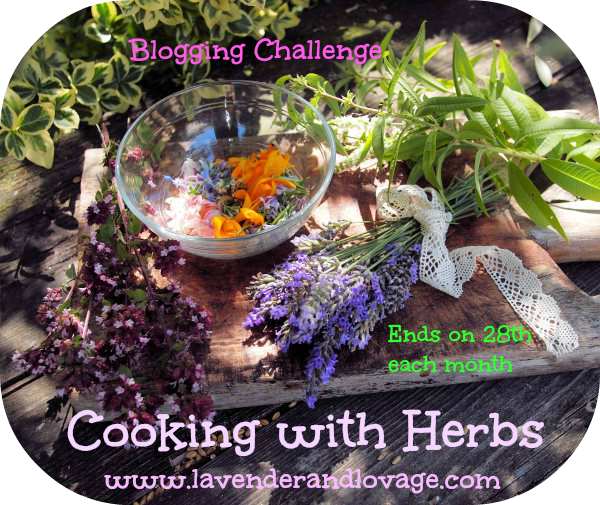 There may only be one herb in this, coriander, but it is probably my favourite herb so I am entering this dish into the Herbs on Saturday Blogging Challenge for June run by the lovely Karen over at Lavender and Lovage. I used to think I didn’t like coriander, having had it in numerous Mexican restaurants and finding it had a slightly bitter aftertaste. That was until I tasted it fresh – plucked from the plant, chopped & used immediately. It was a taste revelation and converted me instantly from using dried herbs in my store cupboard to growing fresh herbs on my windowsill and in the garden. So, dear reader, do tell – what is your favourite picnic food, or indeed your favourite herb?